Steven (Chicagoland, United States) on 2 March 2011 in Art & Design and Portfolio. 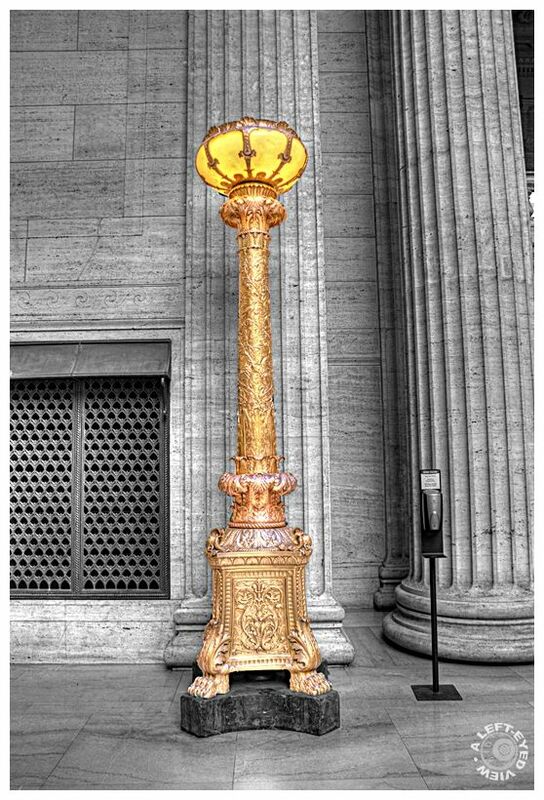 One of many brass lamps with claw feet found in the Great Hall of Union Station in Chicago. Photo captured February 8, 2011.
so great work - bravo! Stunning colors, is it a selective desaturation ? I really wonder. well seen and documented - esp the side-by-side of this very imposing and elaborate candelabra and the puny "phone"! i also like partial desaturations like this - it's just too bad i can't do them with my softwares (yet!)! Wow - what a marvelous piece of art. It is so sad that these were done by hand and now "replica's come by container load into the ports...perhaps not looking like this exactly - I hope not really...this is awesome Steven! Nice selective colouring, the detail in the artwork are tremendous. Very nice treatment of colors and beautiful framing and compo,love the warm lighting,lovely contrast. I love the lamp, the textures, and especially the select color. This is a beautiful shot. More brass than a four star General... Like the contrast between the gray background and the brass. wow . . from the days when style for the sake of style meant something ! You made it simply glow!